My frostbite sailing was canceled yesterday due to the rigging being too iced up to raise the sails after this week's big storm, so my wife and I headed out to The Woodworking and D.I.Y. Show in Springfield. It was a lovely drive on the Mohawk Trail through snowy country, and the Berkshires seemed dreamlike on account of that frosting. 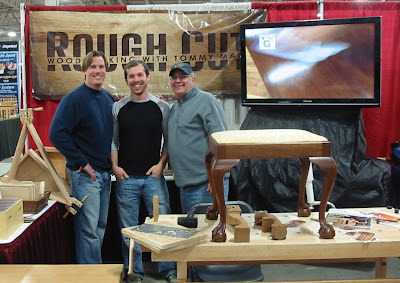 Since I knew this was primarily a show for power tools, jigs, bits, and blades, and less for hand tools, I was mainly interested in seeing who I might meet. 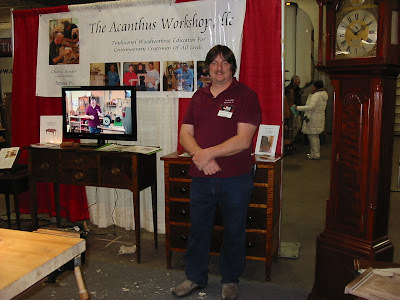 The first booth I found interesting was Chuck Bender's Acanthus Workshop. Chris Schwarz got some video of one of Chuck's pieces in this blog post last year. He does gorgeous work. Adam Cherubini says Chuck is one of his favorite woodworkers, an expert in 18th century work. I bought a copy of his dovetailing DVD. Chuck with several of his fine pieces. 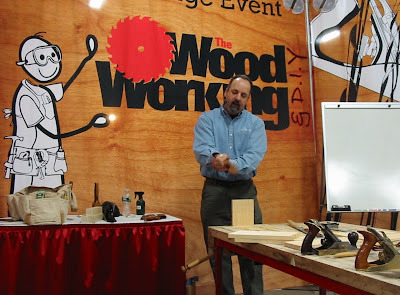 Matt Bickford was also at Chuck's booth, demonstrating his gorgeous hollow and round wooden molding planes. I had met Matt at the December Lie-Nielsen Hand Tool Event held at Phil Lowe's Furniture Institute of Massachusetts. Fine Woodworking was there doing some hand tool presentations. FWW Art Director Michael Pekovich demonstrating hand cut dovetails. He put together a nice tight joint and passed it around; the guy sitting next to me said, "Man, how does he DO that?!?" Tommy Mac of the new PBS show Rough Cut was there with a couple of his cohorts. He's a very friendly and gregarious guy. Tommy with Eli Cleveland, Al D'Attanasio, and a few of the projects featured on the show. 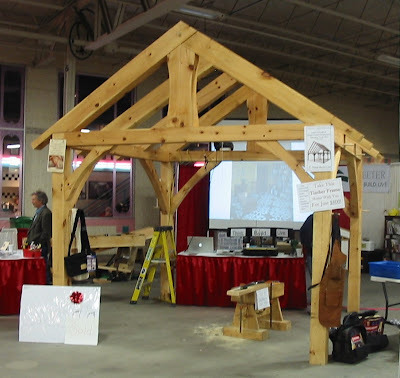 One of the highlights I was looking forward to was the Shelter Institute's timber frame structure. Cool! I would have loved to have seen this going together. In addition to all the power tool booths, there were several nice turning demo booths, including one with an old cast iron treadle lathe about the size of a sewing machine table. Cook Woods was there with a spectacular specialty lumber trailer full of exotic hardwoods. I got to try out several planes at the Lee Valley/Veritas booth, where they appeared to have one of everything in their catalog. The last person I met was someone I had actually been wanting to meet for a while. As we were getting ready to leave, I noticed a booth selling the Sharp Skate and Shapton stones. I thought, I know who that is! It was Harrelson Stanley, who runs the Shizutani School just down the road from me in Pepperell, MA. He also maintains the Japanese Woodworking Forums, where readers know him by his initals HMS, and sells tools at JapaneseTools.com. I asked him for advice getting my maebiki nokogiri to cut without binding, and he suggested more set to the teeth, then laughed and said, "You know, those guys eat 5000 calories a day to be able to use those!" While I've focused primarily on learning the English/American style of hand tool woodworking, I'd love to learn the traditional Japanese style, so I'm hoping Harrelson puts together a nice class schedule. This show has been in the decline over the last few years, but I was really pleased to see that despite the economy, it seemed greatly improved this year (I made the trip out there on Friday). You should definitely do that! I'm planning on going this Friday. It would be good to meet up with you again. I had forgotten that you had an interest in woodworking, and I see you have put the time to spectacular use! I'm adding you to my blog list.